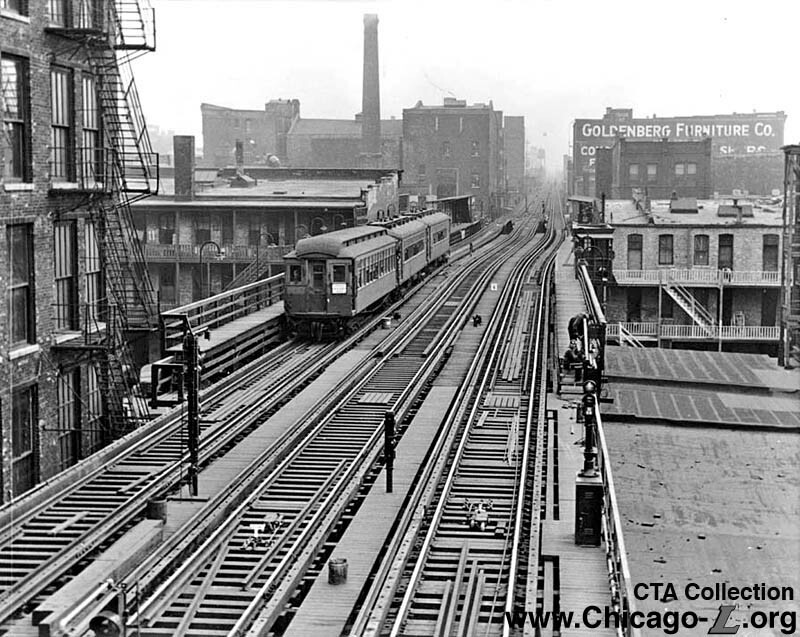 18th Street was one of the original ten stations of Chicago's first "L" line, the South Side Rapid Transit. The original station building was a grade-level structure built in 1892 with a brick exterior, a large bay in the center of the front elevation, and extensive terra cottage ornamentation on the front facade. The station had two side platforms with short "humpbacked" canopies. 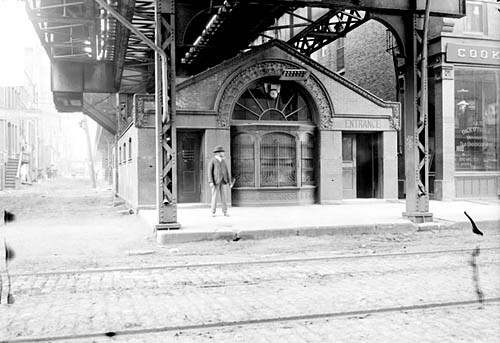 In 1907, as part of an ordinance to allow the South Side Elevated to install a third track for express service, all stations north of 43rd Street, including this one, were required to replace their grade-level facilities with mezzanine-level stations, clearing the alley beneath the tracks. 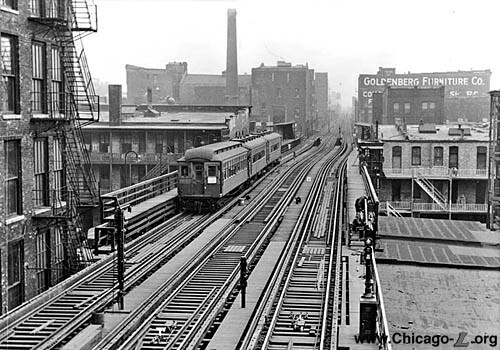 Between 18th and 39th Streets, the third track was added on the east side of the existing elevated structure, with the new track becoming the new northbound track and the old northbound track becoming a bidirectional express track. This resulted in the relocation of 18th's northbound platform. The replacement of the street-level station house with a mezzanine facility required the the elevated structure to the raised at the station (with grades of up to 1.44% at some stations to compensate for the change in elevation) as the city ordinance permitting the work required that there had to be sufficient clearance under the mezzanine for vehicles to pass. The mezzanine station facility was a fairly simple structure, constructed of sheet metal with simple ornamentation. While the original street-level station house was at the sidewalk along the property line, the mezzanine station house was set back from the south sidewalk about 40 feet or so. 18th station was one of 23 Howard, Jackson Park-Englewood and Ravenswood stations closed (including 26th, 29th, 31st, 33rd, and 39th on the South Side Elevated) August 1, 1949 as part of the CTA's North-South Route service revision, which consisted of the streamlining of service patterns, institution of A/B skip stop service, and the closure of low-ridership stations. It was eventually demolished. In February 2002, the City and the CTA officially acknowledged the need for an additional station on the Green Line between Roosevelt and 35th-Bronzeville-IIT. A 2002 study by the Chicago Department of Transportation examined daily boarding at potential new "in-fill" stations on the Lake Street and South Side main line Green Line branches. Of the locations for an intermediate stop that were discussed, one of the sites most seriously considered was 18th Street, which could serve developing South Loop housing, Soldier Field, and the Prairie Avenue Historic District, and which has a crosstown bus line. The other site that had the best results in the study was Cermak. In 2009, CTA was still actively studying and considering the development of an "in-fill" station at 18th or Cermak. A new Green Line station at 18th or Cermak was part of a city planning report submitted to the Regional Transportation Authority on Tuesday, September 15, 2009. An 18th Street station was noted to potentially provide easier passage to Soldier Field and the lakefront. However, in 2011, the City announced its intention to move forward to Cermak as the location of a new station for the South Side main line section of the Green Line. 1. Meyerson, Ben. "Details emerge on Cermak Road Green Line station." Chicago Journal. 23 March 2012.